An equilateral triangle. It has equal sides (a=b=c), equal angles ( ), and equal altitudes (ha=hb=hc). And the altitude (height) from any side is . 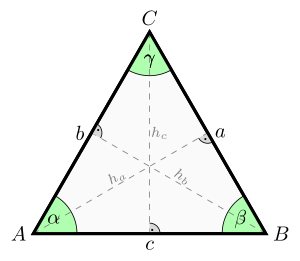 In an equilateral triangle, the altitudes, the angle bisectors, the perpendicular bisectors and the medians to each side coincide. An alternative method is to draw a circle with radius r, place the point of the compass on the circle and draw another circle with the same radius. The two circles will intersect in two points. An equilateral triangle can be constructed by taking the two centers of the circles and either of the points of intersection. In both methods a by-product is the formation of vesica piscis. The proof that the resulting figure is an equilateral triangle is the first proposition in Book I of Euclid's Elements. The area formula in terms of side length a can be derived directly using the Pythagorean theorem or using trigonometry. Equilateral triangle Facts for Kids. Kiddle Encyclopedia.